In some cases, swollen eyelids may be symptomatic of a bigger health problem, such as orbital cellulitis (a sudden infection of the tissue surrounding the eye), Graves’ disease (an autoimmune eye disorder associated with abnormalities of the thyroid gland), and ocular herpes (a recurrent viral infection that can cause inflammation and scaring of the cornea). In general, swollen eyelids are accompanied by symptoms such as itching or scratching sensations, excessive tear production resulting in watery eyes, obstructed vision, redness of the eyelid, eye discharge, and eyelid dryness or flaking. 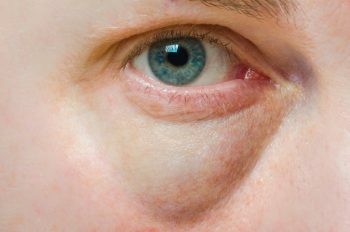 Pain generally accompanies swollen eyelids that are caused by an infection.